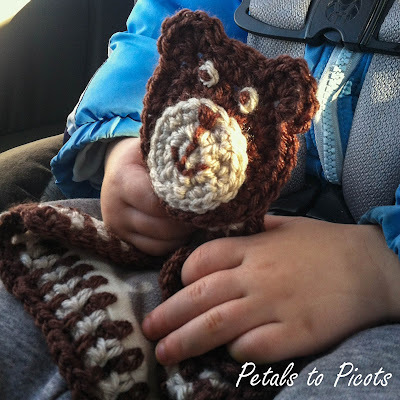 My little bear has a new friend … a little bear of his own! He was very upset when the zipper broke on his favorite bear pajamas, and we just couldn’t fix it. 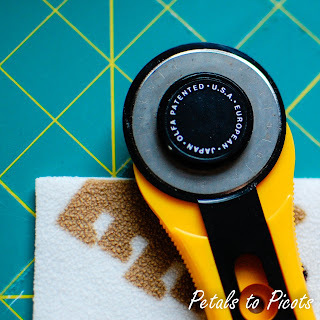 I tried to think of what we could do to salvage them when I remembered the cute little monster lovey blankets from Repeat Crafter Me, and I knew that’s what I would do. I grabbed my rotary cutter and mat and cut 2 pieces of the same size out of the pajamas. Next I worked a single crochet border around the fabric. With wrong sides together, I used my Sharp Crochet Hook to poke holes through the fabric and pull up a loop, then I used a regular crochet hook to finish off the stitch. You can continue to work your border in any style you’d like. 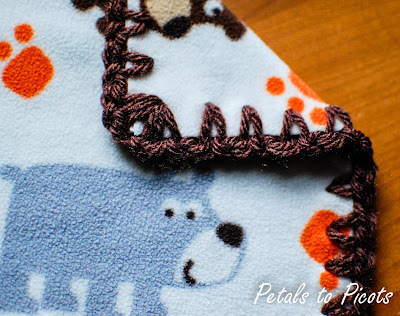 Click here for a few blanket edging patterns you can try. With dark brown, make a magic ring. Round 1: Ch 2 (counts as st), work 7 hdc in ring, join — 8 sts. Round 2: Ch 2 (counts as st), work 1 hdc in same st as join, 2 hdc in next st and each st around, join — 16 sts. Round 3: Ch 2 (counts as st), work 1 hdc in same st as join, 1 hdc in next st, *2 hdc in next st, 1 hdc in next st, rep from * around, join — 24 sts. Round 4: Ch 1 (does not count as st), work 2 sc in same st as join, 1 sc in each of the next 2 sts, 2 sc in next, 1 sc in next, Sl st in next, 5 dc in next, Sl st in each of the next 5 sts, 5 dc in next, Sl st in next, 1 sc in next, *2 sc in next, 1 sc in each of the next 2 sts, rep from * twice more, join — 37 sts. With beige, make a magic ring. Round 1: Ch 1 (does not count as st), work 6 sc in ring, join — 6 sts. Round 2: Ch 1 (does not count as st), work 2 sc in same st as join, 2 hdc in each of the next 2 sts, 2 sc in next, 2 hdc in each of the next 2 sts, join — 12 sts. Round 3: Ch 1 (does not count as st), work 2 sc in same st as join, 1 sc in next, * 2 sc in next, 1 sc in next, rep from * around, join — 18 sts. Fasten off and leave a long enough tail to sew the snout to the face as shown. Weave in ends. Using a tapestry needle, stitch eyes and mouth as shown. Sew bear applique to the blanket lovey. My baby was so excited to get his new lovey that I barely finished my photo shoot before he grabbed it. ♡♡♡♡♡ awwwwwwwwwwwwww! Beautiful!!! Thank you!! 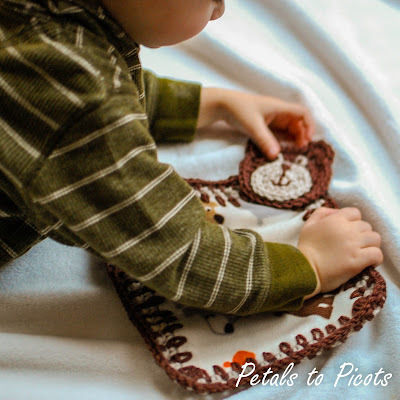 That’s a great idea to recycle and make something nice for your little boy! Your pictures are beautiful, as well as the notes, really help me understand how to do this beautiful work. Thank you for sharing this cute pattern. I have recently discovered how to print, so I’m collecting some crochet patterns. 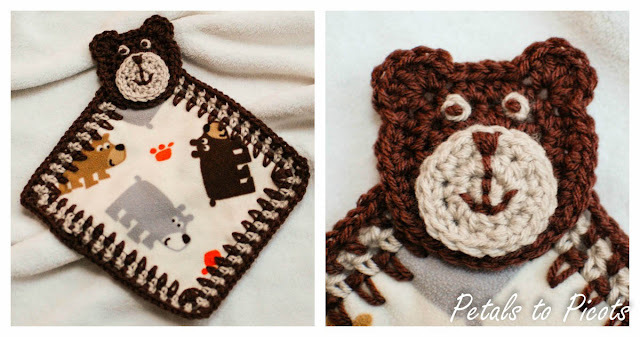 I’m a stay-at-home Great-grandmother, care-giver and I love this little bear pattern. You have made my day! Love the bear face have made the puppy loveys and like the paws too would you use the same for a bear as a dog? If you decide to do more than one or two of these, you might want to purchase the skip stitch rotary blade. We crochet edges on baby blanket size fleece for our local hospitals NICU and needy and use the original #1 skip stitch. It pokes the holes for you. http://www.skipstitch.com/products–orders.html We’ve made hundreds of blankets and only replace the blade when we’ve run it over the edge of my cutting guide for the umpteenth time and it torques the blade. They haven’t gotten dull at all and are very sturdy, we’re just really rough on them. I just used a sharp crochet hook. I love this idea. It’s so cute. I love unique ideas. Am going to borrow your idea and make a lovie with different textures material, fleece on one side and fuzzy/quilted on the other. Would you elaborate on the technique a little more? It looks like you used two colors of yarn for the border, dark brown and beige? Can you give me specifics on the border? The edges of the blanket look very smooth (unfrayed) Did you sew the two pieces together on a sewing machine first or fold the edges in? How specifically did you attach the head to the blanket. Are the stitches showing in the middle of the blanket in the back? Hi Linda 🙂 So glad you like it!! A great idea! I’m just gonna see if I can adjust the placement of the ears and make it into a meerkat for my son. I’ll let you know how I get on! This is the cutest idea that I have seen in a long time. And with my affinity for bears….well on my way to making one. What a positively simple yet wonderful idea. Thank you for this. Its adorable. Thank you for sharing this curettes blanket. I love your lovey! Such a great idea! Can I use your pattern for items to sell on my craft stall, please? Thank you so much – they’re adorable. I am thinking of maybe working out a pattern for a pig! Love your pattern. I was looking for several different type patterns for items I make and donate to our small local hospital registration/ER department. I make small huggable items for children who are coming in for tests and ER visits. It gives them something to hang on to as they have to be treated. Some kids are just scared of being poked and proded. Some are just in pain from their injuries. love it – I was able to modify it a little and make it look somewhat like a bunny for my adorable granddaughter, and also a monkey for my super duper grandsons. I like to use them as give-aways as well. Fantastic idea and it looks sooooooooooooo cute!! THIS makes me NEED to learn crochet. This is adorable, I LOVE LOVE it!! So sweet!! I forgot to ask, what size crochet hook did you use for the face and snout? Too cute! Thank you for sharing. How big is your square? The fabric/crochet combo in this project is awesome. The bear is adorable. Thanks for sharing the pattern – you always do such a nice job.